You are at:Home»Articles»In God We Trust? Who is the “we” in that expression? The Native Indian? Black people, who were brought here against their will in chains and placed in servitude to those who enslaved them? Hispanics and other people of color who fled their oppressive governments to find a better way of life for themselves? Is America a lie? Has it been living a lie? Is it blessed by God? What about the people who believe that it was God’s will to take what was not theirs to take? Have they lost all sense of decency and massaged their consciences into blindness that a terrible thing has occurred. A terrible thing? Do they really think that they will escape punishment from God and that these heinous acts have been overlooked by The Most High God? Could it be that by making God, His Christ, Angels, Adam and Eve, Moses, Noah and the others look like them and aggressively portraying them in their likeness in art, film, and literature somehow lessens the wrong or wipes the slate clean in their regard? Don’t want to acknowledge or talk about it. We wonder why we have race problems in America. People of color want acknowledgment for what was done to them. They do not want to be made invisible and of no account. Most White people I know are heartless. They really do not care. For those “good” White folk who go out and participate in marches and demonstrations against White supremacy and racism miss the boat. The media misses the boat. The problem with race in America is not the people of color within America, it is a failure of White America to acknowledge that (1) Their ancestors stole a land that was theirs and made claim to it, (2) brought to the land their ancestors stole slaves and they benefitted, (3) made invisible or of no account the people their ancestors took the land from and the people who were brought here from another continent and made their slave, (4) flaunting their wealth and prosperity that was made possible by those they enslaved, (5) proudly proclaiming that America is their (the White mans) country, (6) not including the Indian, Blacks, Hispanics and Asians to the same or more extent to White people in “American: history, and (7) using their religion – Christianity – to maintain power and control over them and to keep them pacified and kindergarten-level. America is damned for what it has done. God is not mocked and you will see His wrath for making a pretense of being godly. You have not treated people of color with you with dignity and respect. You don’t even like them. I was watching the news about Hurricane Irma that came up the east coast of Florida and one of the news mediums showed video of people looting. The people in the video were Black people. (I read articles of White people engaged in looting as well but these stories rarely told or displayed on TV for all the world to see. Black people looting make for good TV ratings and it also perpetuates a belief many White Americans have that we are animals and prone to criminality. One individual who was being interviewed shook his head in disgust saying, “Those people should be ashamed of themselves.” I agree! I was disgusted as well. However, don’t make it seem as if certain elements within the Black people are the only ones engaged in acts of criminality? And, we are talking about looting here! What about lynchings, enslavement of a people, usurping and taking a land that was not yours to take, dropping two atomic bombs on a people. Don’t tell me that we should be ashamed of ourselves! What about you? Your excrement does not stink? You hypocrite! This “we can do no wrong” attitude is precisely why people of color in America are up in an uproar. Many White Americans are quick to point a finger at the faults of another people, but fail to acknowledge that the smoke of their crimes has risen to high-heaven and noticed by God of all of us. Many White people play God and some even think they have God in their pocket and that He is with them. Boy, are the mistaken. They have no idea how mistaken they are. 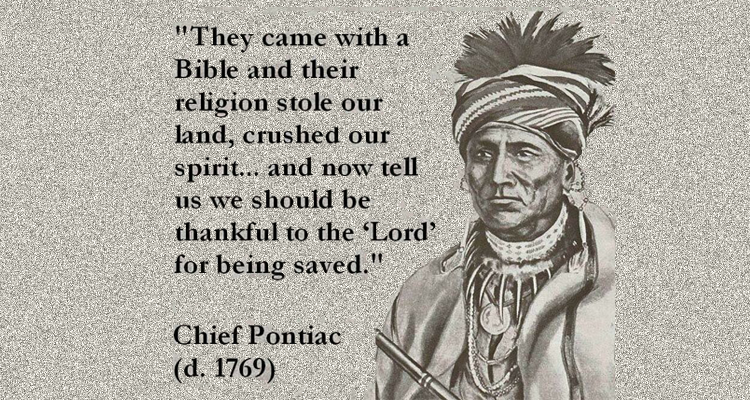 When I see the image of the great Indian Chief Pontiac, I get teary-eyed because I get it. I understand that feeling of being crushed in spirit having a foreign god my ancestors did not worship imposed upon them. I know what it feels like to have something valuable taken from me: An identity. To have an African name and identity taken from me and having a European one imposed. Many White Americans don’t get it. Many White people in the rest of the world do not get it. Some do. They don’t get what that does to a people. Man does not have the answer or the cure. It is not a White man’s concocted God – the one that has been encased in a book – that will provide the cure for what ails the nations, it will be the invisible God – the Creator of mankind and Creator of the heavens and the earth – who will. Previous ArticleDifficult Times Hard To Deal With?